What I love about C2C Festival is not just the high calibre of artists that it brings but also the connection it seems to have with the artists too. C2C seems to be more than just another gig to everyone who plays there, it is a memory, a feeling and for some artists, kind of like a home. Take Kristian Bush for a very good example – he was the very first artist to play C2C Festival when it first opened its doors in 2013. This was the first time Kristian had played anywhere as a solo artist and he more than impressed the audience and became somewhat the heart of the festival. Kristian returned to C2C last year to host the CMA Songwriters series on the Thursday before the official C2C event kicked off and won a new audience and reminded his already fan base why it is they love him so much – this guy is a very funny and very humble man. Also last year Jennifer Nettles played for the first time in the UK as a solo artist on the main stage with her solo material. Dreams of a reunion quickly surfaced the moment they were both announced but were dashed when she didn’t appear at the Songwriters show as a special guest. I had interviewed her moments before and asked her the possibility of a reunion over the weekend to which she said no. Both Jennifer and Kristian have released highly impressive solo material which we all love. It is no wonder that Sugarland worked so well given how talented the two are at songwriting. Jennifer’s two albums That Girl and Playing With Fire were both pretty sensational. Jennifer as you know has an incredibly strong and distinctive voice that at times is so powerful, I wonder if she really needs a microphone as boy, can she project her voice. Jennifer has the type of voice that can carry well in a musical theatre production and I realised this when she duetted with Idina Menzel (Rent, Wicked, Frozen) on the Christmas song Little Drummer Boy, which is fantastic and has become one of the most played Christmas songs in my household. Jennifer’s album That Girl was released in 2014 via Mercury Nashville and Playing With Fire was released in 2016 via Big Machine Records. Jennifer wrote most of the Playing With Fire album with Brandy Clark and Shane McAnally. Brandy also joined Jennifer on the Playing With Fire tour. It is nice, I won’t lie, to hear Kristian as a singer because we never really got a chance to hear him that much with Sugarland but we do miss them together. Kristian not only became the first person to play C2C Festival but it was also his debut as a solo artist to which we, the UK are very privileged to have had been a part of. Kristian released his song Love or Money a week later. In 2014 Kristian released his official debut single Trailer Hitch from his album Southern Gravity which was released in 2015 via StreamSound Records. As a songwriter, Kristian is very successful and has won an impressive six BMI Awards. Both Kristian’s writing and producing talents have made appearances on various artists records including producing Lindsay Ell’s debut studio release The Project where he is also credited as a songwriter for the song Wildfire. 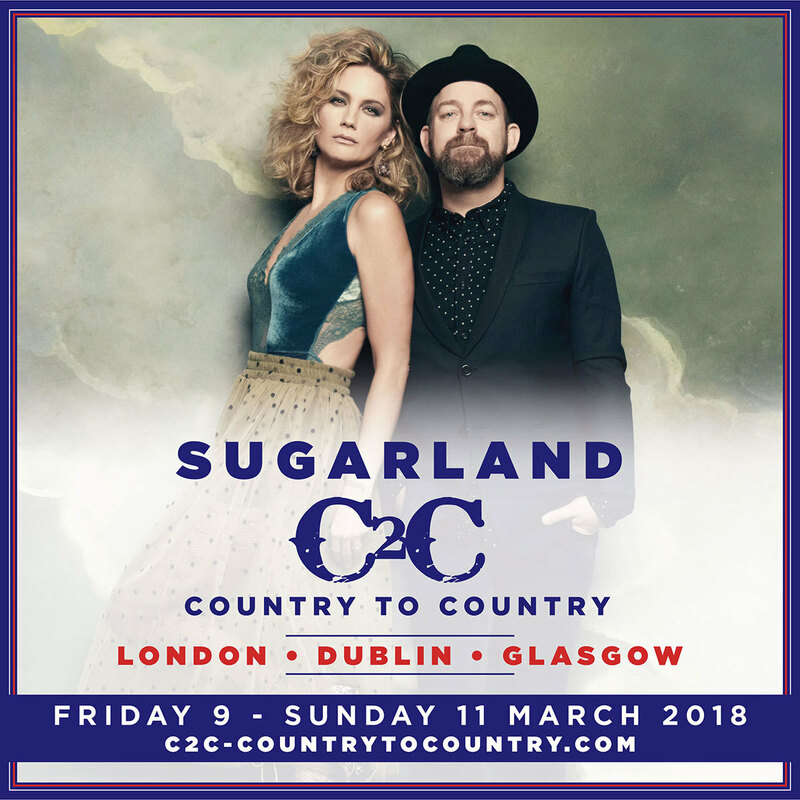 Due to Sugarland’s hiatus and due to both Kristian and Jennifer having successful careers, it was almost a certainty that the duo were never going to reunite so when the pair announced that they were not only going to be reuniting for new single Still The Same but to also play at C2C Festival 2018 on the main O2 Arena stage. well, fans went absolutely crazy. This was something very unexpected and something we only dreamed of. The last time Sugarland were in the UK as a duo, not individually was 2011 for a promo tour where they performed Stuck Like Glue on shows such as Graham Norton and played a session on BBC Radio 2 with Bob Harris. Sugarland are one of country music’s biggest duo’s who gained much success in the past with five studio albums and a string of successful singles. Sugarland’s debut single Baby Girl off of the Twice The Speed of Life album put them on the map. Baby Girl was Co – written by Troy Bieser and all members of Sugarland including Kristen Hall back when Sugarland were a trio – this song remains to be one of Sugarland’s much loved hits to date seeing both Jennifer and Kristian playing it on their solo tours. In 2006 Sugarland became a duo after the departure of Kristen Hall. The same year, Sugarland released their second album Enjoy The Ride which saw the release of the ever popular single Stay. Stay has become one of Sugarland’s masterpieces so to speak. The song was the first of Sugarland’s to be written solely by Jennifer Nettles and its moving music and lyrics have seen the song reach great heights including two Grammy wins for Best Country Song and Best Country Performance from a Duo/Group. It also ACM Awards for Song of the Year and Single of the Year, a CMA Award for Song of the Year and a CMT Music Award for Duo Video of the Year. The emotive ballad speaks from the perspective of a mistress who is begging for the man with whom she is mistress to, to leave his wife. Don’t I give you what you need? Baby, why don’t you stay? The video for the single was kept very plain and simple so as to concentrate on the emotional side of the song to which Jennifer delivers perfectly. The video was charted at number 10 of CMT’s 100 Greatest Videos. In 2008 the duo released the album Love On The Inside which featured the lead single All I Wanna Do and singles Already Gone, It Happens and Joey. In 2010 The Incredible Machine was released and saw the singles Stuck Like Glue, Little Miss and Tonight. Stuck Like Glue was the most memorable off the album with its quirky, up beat sound, certainly seeing a different side to the duo. I find it a love it or hate it kind of song. Current single, Still The Same was released late last year (2017) and maintains some of that Sugarland signature sound as well as a bit of a fresh new look. Sugarland are said to still be working on a new album which is to be released later this year. The twosome will hopefully treat C2C fans with some of their new material as well as all their much loved past hits. Either way, the C2C audience are in for one hell of a great show and get to be a part of a very special reunion that will remain in people’s memories for years to come.